On the top of Everest, he was even able to take off his gloves and write two SMS, says the 50-year-old. In one of them he asked his girlfriend Heike for her hand. The marriage proposal was not spontaneous but planned for a long time: “Otherwise I would not have had the sign with me.” Later Thomas took a picture of it on the highest point on earth. 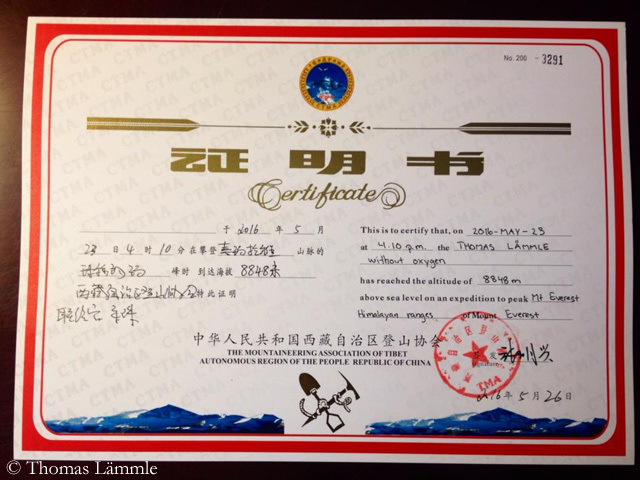 Actually, Laemmle had already planned to climb Cho Oyu and Everest without oxygen in 2015. 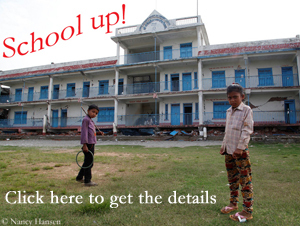 “After four weeks the earthquake in Nepal put a spoke in my wheel,” writes Thomas. 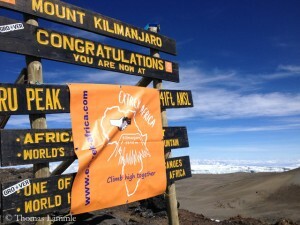 Well-acclimatized, Thomas reached Everest Base Camp on 16 May. 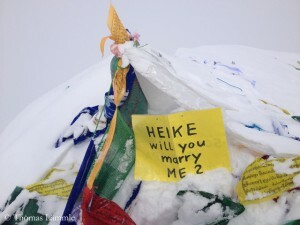 His plan: regeneration below 5,700 meters regenerate and then directly the summit attempt. 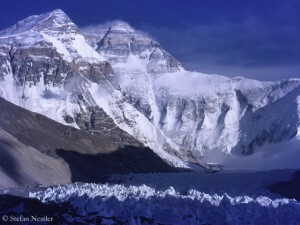 To avoid being stuck in traffic jams on the Northeast Ridge – “About 100 climbers were waiting in the wings.” – Laemmle, in consultation with the Austrian meteorologist Charly Gabl, decided to make his final summit push on 23 May – two days after the date that most of the other mountaineers on the north side of Everest had chosen. But there were also some traffic jams on 23 May, says Thomas: “Until sunrise on the ridge at 5.30 a.m., I was terribly cold due to lack of oxygen. My boot heater was running on full blast. Then I finally found a sunlit rock on which I could wait until the jam at Second Step had dissolved.” There were two more short jams behind this key point. Finally, he reached the summit at 2 p.m. – as last climber from the north side. An hour later, Thomas started his descent. 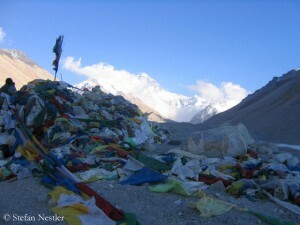 In the evening, in Camp 3 at 8,300 meters, it began to snow, and snow penetrated into the tent. “Shortly thereafter, the stove was not working any more,” says Laemmle. “I had no chance to do something against dehydration. In order to prevent a pulmonary edema, I spent the night sitting in the tent and awake.” When it got warm again the next morning, he managed to light the stove and melt snow for half a liter of water. However, because strong wind was predicted, he finally breathed bottled oxygen. 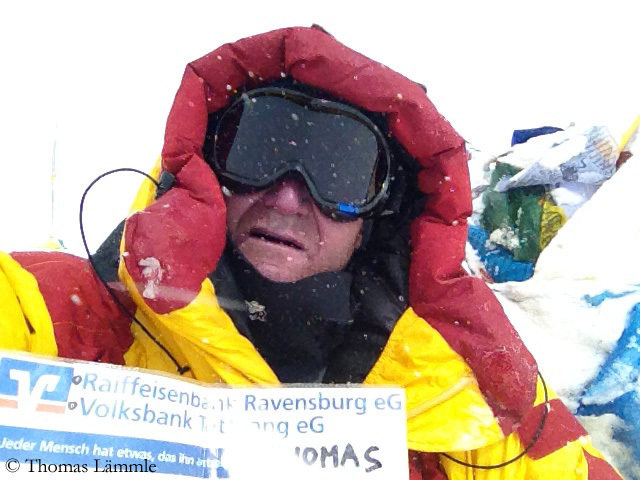 “I thought the risk of frostbite due to dehydration and strong wind was too great,” writes Thomas. 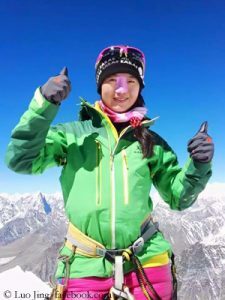 “I decided to use the emergency oxygen to save fingers and toes from frostbite during the descent.” At an altitude of 7,400 meters, the bottle was empty. From there, he continued to descend without supplementary oxygen again. 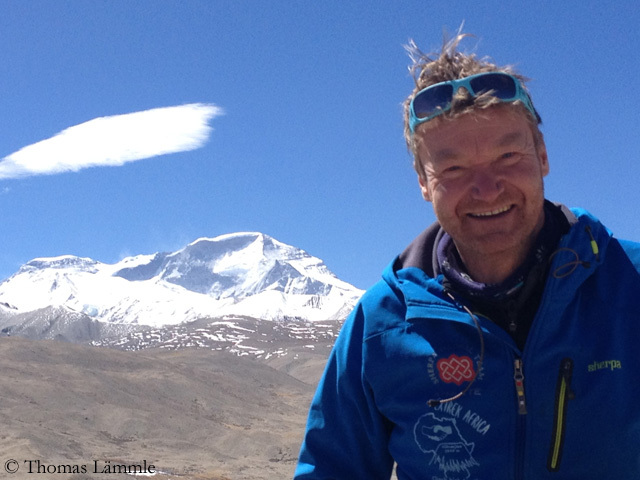 Lammle’s success will hardly be listed in Everest statistics as an ascent without bottled oxygen because he used a breathing mask on his descent. It doesn’t make any difference to Thomas. He will return home physically unharmed. 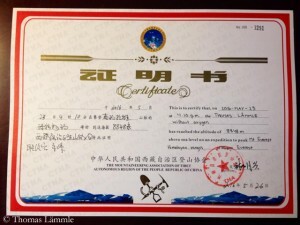 And after all, he has a certificate that he made it to the summit of Mount Everest without supplementary oxygen.